No, that’s not a new lens in the picture above, but two pieces of news: firstly I have a XH adaptor in hand and am running tests with the existing H lens lineup. So far: they work exactly the same as on the H cameras, with identical image quality, just without AF (for now). No surprises there, as the H6D and X1D share the same platform. More interestingly, several new lenses were announced today that will round out the X platform in and of itself – a 120/3.5 1:2 macro; a 35-75mm zoom; and 22mm and 65mm primes. I was involved in some of the planning around these lenses and the aim was to balance quality with size and other properties such as parfocal zooming and magnification ratio; such optical design considerations are a delicate balance between size, performance, price and design complexity. HI, thanks for all the valuable information. I have the X1D and the XD adapter and can get the HTS. I intend to use it with the 35mm H lens. This would work right? Live view focus naturally! Thanks! Hi Ming, what are your thoughts regarding the forward weight when you used the X1D + XH Adapter + H lens. I am keen to use the same set-up with HC 100/2.2 and HCD 28/4.0 once the XH adapter is available. I do have a RRS long lens rail set-up but wanted to know if your set-up is viable without the rail or is it too much weight? Workable handheld without the rail, but on a tripod you might want it if you don’t have an L bracket because the centre of gravity is quite far forwards. What are your experiences with focus shift? I got the information from my dealer that Hasselblad is discussing a software solution for the AF-system. Thank you very much in advance for your information. a Ricoh GR II.I still have a 500 CM with 100, 180 and 250 mm lenses. I haven’t seen it at longer distances personally – there does appear to be some (minor) at closer distances, which I’ve advised HQ about. It should be possible to compensate it with software since a) shift b) distance c) aperture are all known and mappable parameters. Mechanically, it works – but the firing sequence is a bit different to the normal lenses and has to be changed, plus profile support etc. It wasn’t part of the original plan because it goes against the small and light ethos, but I believe they’re working on it for a future FW release. Ming, maybe it’s a rhetorical question because of your image shown the X1D with HTS 1,5 T/S adapter – but my local Hasselblad dealer told me (based on Hasselblad information) that the X1D cannot be used with the HTS 1,5 T/S adapter. So, does it work fine? This is an excellent development. To me this says Hasselblad has a clear mission for the X1D system and the discipline to avoid scope creep. Too often manufactures throw in any and all features they can imagine “just in case”. This invariably leads to cluttered interfaces, pointless scenes modes, substandard video capabilities, etc. in a stills camera. I applaud their courage and wisdom in perfecting a limited feature set and avoiding the trap of trying to be all things to all people. Poor judgement is option available to even those with limited resources. I stand by my comments. Waiting for the 120mm or buying the 150mm + Adaptor ? The Fuji does not have a leaf shutter, and your flash sync is limited which makes outdoor portraiture pretty difficult, actually. 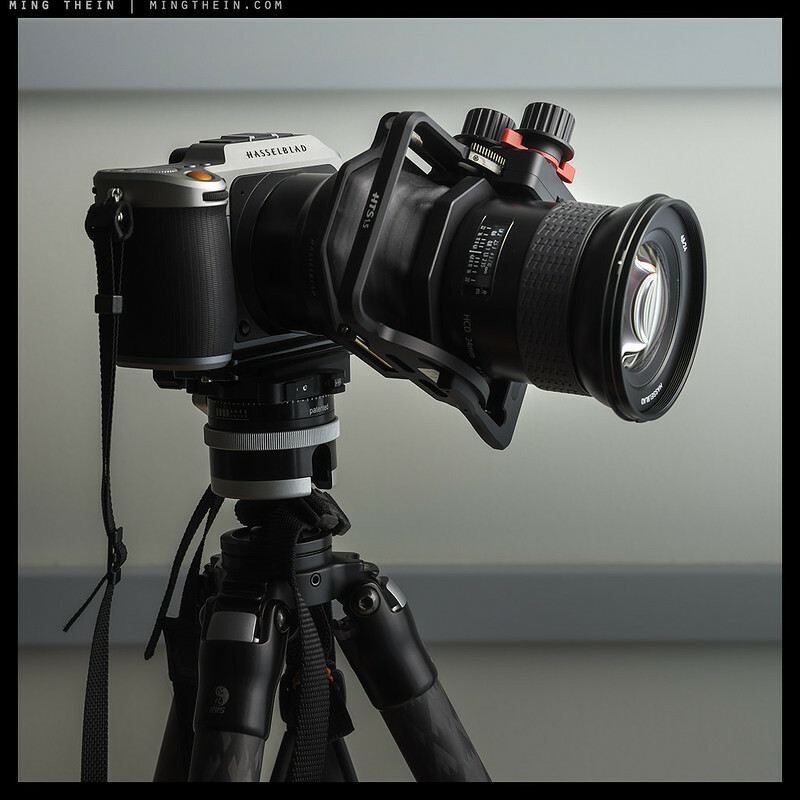 Their leaf shutter solution is…an adaptor for Hasselblad lenses! Thats what happen when you involve “real” photographers. Everything is right. The weight of the lenses are on point. All said I do wish for the 65 to be a faster one. F2 or F2.5 would be awesome , Do you have any ideas what the F stop of that lens might be ? The line up is pretty much complete with 1 or 2 more lenses. Thats impressive actually for a smaller company to introduce a new system and complete it in 3-4 years. Not sure at this point – I do know the limitation is both the leaf shutter and the optics: too fast, and you land up with massive lenses or unreliable leaf shutters. A longer tele and faster portrait lens are about all that’s missing now, I think. For a faster portrait option I think the H 100 f2.2 is already great. Not that big and heavy and has a unique rendering. Now Im pretty sure Im gonna get X1D. 30 & 65 & the 120 would be my choice. I may as well get the 100 2.2 if I feel the 120 is not fast enough. I love the 50 and 100 on both the 44×33 and 54×40 sensors – the 100 has a binary personality; it’s soft but lower contrast wide open, but by f4 it’s a razor. Why is the AF not maintained with H lenses? How can this change in the future? Requires a different algorithm, from what I understand – the X1D is set up for CDAF but the H lenses are PDAF. Fujifilm hasnt launched yet so there’s nothing for them to steal. Fuji botched their X-T2 launch pretty bad. Several people I know went to Sony because the X-T2 launch was so late in getting to the shelves. is a shame how the xh adapter does not have a tripod mount..even fuji’s H adapter has it, putting 2,3 kg of weight infront of the 700gram body is definitely is not comfortable to see even if the mount is strong..
Not possible as they were designed for size as a priority, not a large image circle – full extensive functionality is the purpose of the H. The X is a lightweight camera that doesn’t sacrifice image quality. Now that there is a XH converter, what about a “XTS” T/S adapter with XC mount for the camera and the HC mount for the use of HCD-lenses. Would there be a possibility to limit the focus length conversion factor from 1,5 to 1,2 or even 1? Are there any plans for this option? It would open up the use of the X1D with T/S for wide angle architecture photography for sure. The upcoming XC 21 mm. will be nice, but using the HCD 24 and 28 on such an adapter would even be better! Thanks Ming for you fast teply. Far from understanding any of the optical science behind the T/S adapter, are there not two parameters changing with an X1D involved. First the distance between the sensorplane and the lensmount (around 53 mm.difference between the H6D and the X1D) and second the difference in the diagonal of the bigger sensor of the H6D and the diagonal of the X1D sensor (78,5 mm. against 64 mm.)? The HTS 1.5 has to take in account a diagonal of around 37×49 mm. for the bigger sensor (100Mp) doesn’t it? Wouldn’t that give space and opportunity to design a adapter with the optics to limit the factor to 1,2, and will still give a very sufficiënt wideangle with around 15 mm shift both ways? But my assumptions could be totally wrong. I can understand and concur with your main arguments. Without expanding to much on this subject, two sidenotes. First it is interesting you mentioned the potential problems of maintaining the resolving power of the long flange HC-lenses in a XTS. Because when the original HTS is used with the XH-Adapter and the X1D, the 53 mm. of the XH Adapter is ‘unused’. I imagine the light rays are just guided, as in a H6D, parallel to the film plane. Second, the introduction of an all new X-HTS with the use of the X-lenses, is still also interesting. It could provide with the XC-lens 21 mm. and a factor of 1,5, an effective focal length of just over 30 mm. That is still very very interesting for architecture/landscape and would be the only option for using a native T/S lens with a 35mm.-equivalent focal length under 28 mm. in a (portable) MF system!! I am not talking here about using a Canon T/S-E lens and a Chinese adapter with limited shift and smearing in the corners, but genuine Hasselblad quality with Phocus-control and corrections!!! I think a lot of professional working picture takers are looking for such a solution at the moment. I suspect the 21 mm. won’t sell under 6000 Euro’s. A X-HTS adapter can sell for the same amount, on my account. If this is a viable product, only Hasselblad can decide…..
Much appreciated for taking interest Ming. Adding more optics to lenses that weren’t designed for it isn’t going to yield the quality you expect, especially with extreme wides and extreme ray angles. Yes, it’s interesting, but the market is tiny and we’d have to redevelop everything from scratch. To make a business case prices would have to be commensurate, and then the next statement is ‘too expensive’. There’s ‘interesting product’ and then there’s ‘commercially viable’. We can’t make interesting products if we can’t stay in business. Unfortunately I do know what the market data looks like, and it’s a really marginal prospect at best. I don’t personally need convincing of the utility, but the accountants and investors do. But the H6D and X1D systems are still lacking a serious solution for (the very) wide angle T/S shooting in the architecture/landscape field. The HTS 1.5 never provided this. Although the adapter is still a beautiful piece of equipment. The HCD-24 mm., or the 1,5 factor for that matter, is just not enough. I suspect we will never see a HC-21 mm. and this would be huge and expensive, negating it therefore using it on a mobile system like the X1D. When we can expect your X1D review? Thanks. Any guess when the firmware will be final? In some ways, if/when it is, that means development has ended. If not, it means the product isn’t finished. So…the question is, would you rather have a camera that’s continually improving, or one that’s abandoned? Hi Ming. Can you say if the X1D output will have the same dynamic range and overall quality as the H5D? Parfocal? Nice! Is there a critical reason the wide end of the zoom is at 27mm rather than say a 24 or 25mm like the G-Mount zoom? Yes: making it a bit wider would have required much greater optical complexity (and size/cost), and it isn’t a good tradeoff agains the mission of the X1D.